I’ve worked with Mrs. Prim’s Rai group the longest. 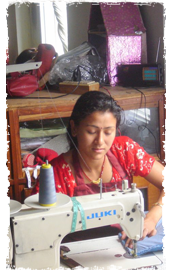 Her story of starting a business is very common in Nepal. She began by making small items herself at home for the tourist shops and over time was able to hire someone to work with her in her home. Over time she made more and more items and began to make items for wholesale customers in Japan, Europe and the USA. She now has over 100 women working with her. Her husband, Mr. Prim Rai works with the local buyers and her brother Ganesh Parajuli, with whom I work, handles overseas buyers. Ganesh, like many people in Nepal is very smart, computer savvy and a good business manager. Over time Ganesh has evolved into more than just a friend and a vendor. He now helps me coordinate production with other vendors, he helps me with photography and printing labels. He has been instrumental in helping me find the best quality artisan groups and helping me explain the importance of quality and consistency, and having product ready when the shipment is scheduled to leave. There are many other groups that we are working with more and more. Sophie Vasu makes many of our high end hemp handbags. Her father had a clothing manufacturing business and she understands good design and knows what good quality looks and feels like. There is a group led my Mrs. Rada Devkota that does all hemp crocheted work, such as hats, handbags and slippers. Crocheted hemp is one of the hardest products to get right and over time we’ve made tremendous improvements in quality and consistency. There is another group, led by Mr. Krishna Tuladhar that does all machine woven hemp work. He has two machine looms and is able to weave things like belts, key chains, handbags handles, and pet leashes. We have other groups that do just felted wool and some that do just handbags made with material, such as crewel work, from Kashmir.